How did I accidentally adopt a pit bull? Our beloved cat was eaten by a coyote. 😦 I know right!?! A coyote! And our dog was really sad when the cat didn’t come home. He was totally depressed. He just moped around the house and he didn’t even really seem to look for her — somehow he already knew she was gone. It was obvious we needed to adopt another pet so he wouldn’t be so sad and lonely. And we agreed to get a dog instead of a cat, since the cat may just end up getting eaten again. We went to the doggie jail and looked at several dogs, walked them and played with them. I didn’t even look at the pit bulls. 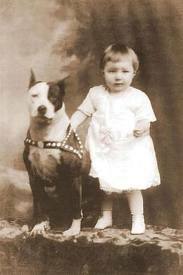 I have kids, one of them has autism — no way we would want a pit bull. As I walked by the cages one dog stood out because she wasn’t barking. All of the other dogs were jumping and barking but she was just sitting there quietly looking at me. The paper on her cage said she was a Tibetan Terrier mix. She was so cute. We walked her and played with her and she seemed to be a really sweet dog. 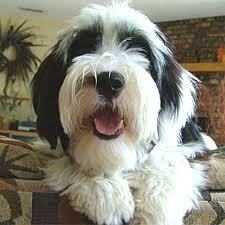 I had no idea what a Tibetan Terrier was. We went to lunch and talked about it and decided to adopt her. I was so excited and went back to get her. She looks just like a … Tibetan Terrier, right? Yeah, I thought so too. So after accepting the fact that I accidentally adopted a pit bull I started researching the breed and found out they are great family dogs. 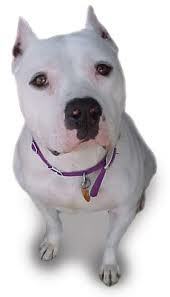 They are sweet, loving, loyal, good with kids, great guard dogs, they love human interaction and are just big loves. We assume they are aggressive dogs, but they have been great family dogs throughout history and have just recently received such a bad reputation. Another lesson on why I shouldn’t ever judge someone, or somedog. 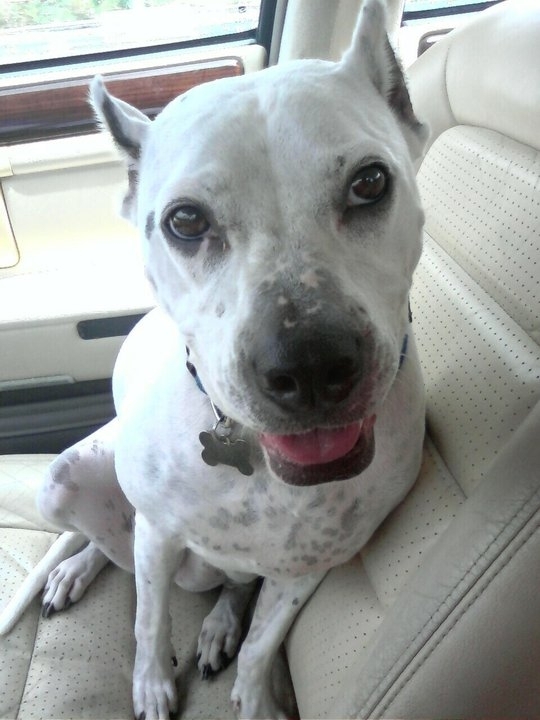 I should have never judged the pit bulls — and I feel bad for not even looking at the cages with pit bulls in them. I am very glad I accidentally adopted one, she is a very welcome addition to our family and such a good girl. He was always different. And while I was pregnant with him routine blood tests came back with indications that he had a 1 in 20 chance of having Trisomy 18 – a severe chromosomal disorder that, if the child is even born alive, results nearly 100% of the time in death before age 1. So when he was born and he was perfect, I was actually quite surprised. I was sure something would be wrong with him after the test results and all of the warnings from the doctors. After all of the special ultrasounds came back normal they told me we should still be cautious, that he could still have some sort of chromosome issue. One doctor actually said “You should still worry.” … Who says that to a pregnant lady? After he was born I asked the nurses and doctor several times if they were sure he was all right and healthy. They assured me he was. It wasn’t until he passed his 2nd birthday that I was convinced something was wrong and came to the doctor with a list of symptoms/concerns about his development. More info on this can be found on my previous post: What is autism? How did you know he had autism? It was April, Autism Awareness Month, and there was a ton of coverage on TV about autism. And a lot of the stories hit home and reminded me of my son. I made an appointment, holding back tears, to talk to the doctor because I was really worried he had autism. The nurse called back and helped me feel better, she said “God chooses special people to have special kids” and it did make me feel better. And I do believe that. She told me to write a list of my concerns and also what he eats, how he acts, etc. The day arrived for the appointment with the doctor. When I got halfway through reading the list I had composed (doesn’t respond to name, spins in circles, walks on toes, in his own world, etc.) she stopped me and said he needed to be evaluated. The steps to follow are intimidating for anyone, especially an unsure young mother – 27 years old – who is also overwhelmed with the business she owns as well as her 4-year-old daughter. Teams of people came to my house to evaluate him. Therapists were booked and they started to come to the house twice or three times a week. I was given assignments: make him ask for each item of food, stop the swing and wait for him to look you in the eye then say “go” and push him, get him ready for full-time school that starts at age 3. The therapists who don’t have children of their own irritate me the most. They give assignments that are unreasonable since they don’t understand what it is like to be the mom of young children. Once the teams came in and asked a million questions we were referred to the neurologist. We had to wait a month for the appointment. The day finally arrived and the nurse practitioner entered the room. Up until that point no one had used the word “autism” when referring to him. They used the terms: “developmentally disabled” or “delayed”. That was how I got the diagnosis. Afterward we went to play at a playground before hitting the road back home. I remember looking at him differently, re-evaluating his future as he played. The diagnosis was brutal, cold, and routine. And it had changed our whole world forever. I felt like I left with a different little boy than I came with. Even though I had known the whole time that something was different about him. Since his diagnosis – May 30, 2007 – life has been a blur. Before he started full-time private school (Hooray for scholarships!) I used to drive to and from therapy appointments all day long, as well as run a business that is open 7 days week, and care for my typical daughter. I had therapists in and out of my house several days a week for years. Now thankfully he gets all of that therapy at his school so I just drop him off at one place and pick him up later. And therapists don’t come to the house anymore. That was a lot of pressure to always have the house clean for the therapist — even though they assured me they understood why I would have a mess, I still felt such pressure to be sure the house was clean. I guess I didn’t want to spoil that whole Super Mom image. An autism diagnosis is nothing to fear and I feel SOOOOO blessed to be his mommy. He’s an awesome kid and I wouldn’t change him for anything.